Ruth Whippman is whip smart; her writing is nothing short of a genius. And scathingly hysterical. Her sociological insights into the New Age movement are spot on and her skewering of Positive Psychology is brilliant. Ms. Whippman would absolutely loathe the sold-out happiness and mindfulness workshops that I teach at The Esalen Institute! Firstly, here is where Ms. Whippman is irrefutable: the $10 billion happiness/mindfulness industrial complex has corrupted researchers to overstate and misinterpret data to benefit the industry in general and their own brands in particular. One can conclude from "America the Anxious: How Our Pursuit of Happiness Is Creating a Nation of Nervous Wrecks" that these professors are better salespeople than scientists. According to the book, several high profile positive psychology professors vastly overstated and inflated results of happiness studies to peddle their own theories which in turn spawned thousands and thousands of books (such as my forthcoming "How To Survive Your Childhood Now That You're An Adult: A Path to Authenticity and Awakening," New World Library, Fall 2017, as well as my Amazon happiness and mindfulness DVDs listed below). Ms. Whippman accuses the happiness/mindfulness industrial complex of selling hope under the guise of happiness. Here is where I would qualify Ms. Whippman's odyssey through the sea of New Age: mindfulness detached from Buddhism is like being the proud owner of one sock. Buddhism is not a religion; it is a prescription to alleviate suffering. The supposed secularization of yoga and Buddhism and the New Age derivatives that Ms. Whippman explores in the first part of her book remove the practices from the broader philosophies, which is what makes most of the recent spate of self-anointed mindfulness teachers and Life Coaches charlatans. If you want a few minutes of rest from the madness in your head, then practice mindfulness meditation; if you want to alleviate your suffering, then study Buddhism. Trying to measure happiness scientifically is like trying to measure milk with a ruler. The problem IS science. Because science looks for direct causality when there are actually infinite factors that contribute to resultant happiness. There are countless variables in flux so it is easy for Ms. Whippman to render some of the key findings of the positive psychology movement absurd - including inanities such as "40% of happiness is due to X" or "Happiness can be increased 20% by Y." Specifically, happiness is a by-product and cannot be directly correlated with one particular activity, which is what the "scientific" studies attempt to do. However, a larger issue concerns paradigms. One paradigm is the medical model of the Diagnostic and Statistical Manual of Mental Disorders (DSM) supported by Big Pharma, which earns billions and billions of dollars on the 100 million prescriptions for antidepressants written every year in America; the other model is the self-empowerment model that the New Age happiness/mindfulness industry is pushing. Although I am a Licensed Psychotherapist, from my New Age perspective, being diagnosed with a disease or disorder or affliction or addiction for which the only remedy is pharmaceuticals is (yes, I realize that looking out the window as I write this here in sunny Santa Monica that I am ridiculously biased) hmmm... what we call DISEMPOWERING, meaning that without medication you are helpless against said disease or disorder. On the other hand, in my workshops I share myriad tools such as authentic communications, yoga, meditation, eating healthily, getting enough exercise, getting enough sleep, getting enough love, that bode favorably for a lifestyle that results in happiness. Being able to construct or reconstruct your life is EMPOWERING. Being told you have a genetic defect against which you are helpless is DISEMPOWERING. Are there genetic defects against which some people are powerless? Absolutely! Are there financial considerations that affect happiness? Absolutely! Are there gender biases that affect happiness? Absolutely! Is there endemic racism that affects happiness? Absolutely! And it is wonderful that as a journalist Ms. Whippman wants to examine happiness within the broader social context(s). But for me, the real culprits that are not addressed in this otherwise pivotal and revelatory (as well as excessively funny) book are 1. Capitalism and 2. Science. As Marshall McLuhan said, "I don't know who discovered water but I doubt it was a fish." Capitalism and Science are the water that we swim in, the air that we breathe. 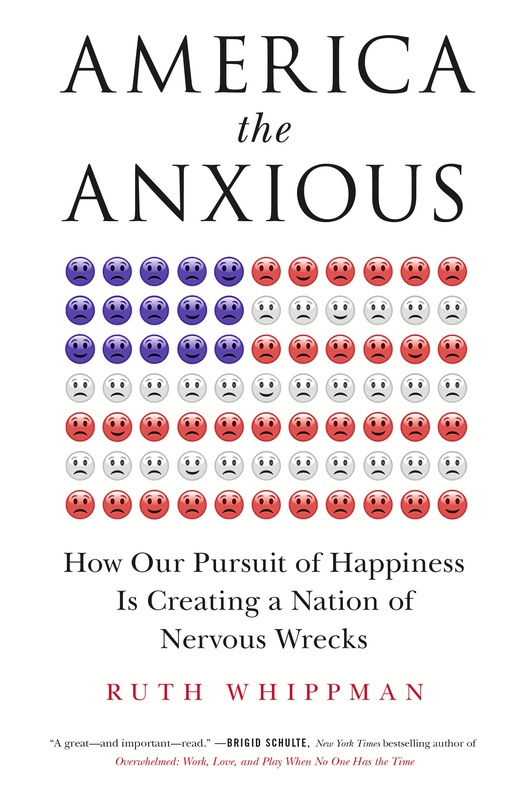 "America the Anxious: How Our Pursuit of Happiness Is Creating a Nation of Nervous Wrecks" pulls back the curtain and allows us to get a good look at the Wizard of Happiness, an industry that is actually causing much of the anxiety that it is supposed to alleviate. This is one of those cases where the cure may be worse than the disease. Great research and savagely brilliant writing from Ruth Whippman! However, from my perch in groovy Santa Monica, I still prefer to empower my patients and students with healthy lifestyle choices than guide them towards the often disempowering pharmaceutical hamster wheel.